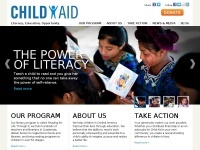 Child Aid is a nonprofit organization that helps children in poverty improve their lives through education. Our focus is Guatemala, where literacy rates are lower than anywhere in Latin America. A profile of Child-aid.org was found on the social network Twitter. The web server used by Child-aid.org is located in Provo, USA and is run by Unified Layer. This web server runs 3 other websites, their language is mostly english. A Nginx server hosts the websites of Child-aid.org. For managing the data of the webpages the CMS WordPress in the version 4.7.6 is used. The website uses the latest markup standard HTML 5. The website prohibits search engines and webcrawlers using the description of the website from the Open Directory project. Other actions by webcrawlers and bots are allowed.